The volume collects Boswell’s correspondence with three of the most prominent members of The Club, and each reveals a different facet of Boswell’s full and varied involvement with life and literature. When an admiring Boswell initiated a correspondence in 1767 with Garrick, he was a promising young Scots advocate who was about to publish his popular and influential Account of Corsica, while Garrick was at the height of his theatrical fame. They carried on a lively, light-hearted exchange, always more urgent on Boswell’s than on Garrick’s part, until Garrick’s death in 1779. A year earlier Boswell had begun writing to Burke, and this correspondence extends until 1791, a period that included much of Burke’s active political life as well as Boswell’s major accomplishments and disappointments. It is characterized by a warmth and ease that gradually turned into a cool distance under the strain of personal and political developments. 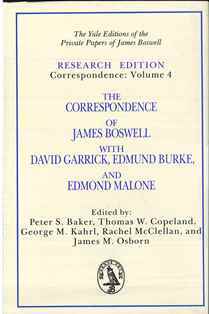 The longest and most intimate correspondence of this volume, that with Edmond Malone, illuminates in a striking manner Boswell’s professionalism as a writer. It begins in 1785 with Boswell and Malone immersed in revisions for the second edition of The Journal of a Tour to the Hebrides, and continues through their collaboration on his Life of Johnson. Throughout, it reveals not only the essential help Malone provided for Boswell, but also the sureness Boswell with which organized and wrote his great works. This correspondence ends only a month before Boswell’s death in 1795. This volume prints a total of 150 letters: 13 letters to Garrick and 16 from Garrick; 26 letters to Burke and 11 from Burke; 43 letters to Malone and 41 from Malone. Sixteen additional letters (10 to Boswell and 6 from him) of which no texts are known to be extant, receive notice under their proper dates, with as much information about their contents as could be gathered. Boswell’s correspondence with Burke also includes 1 letter from Burke and 1 letter to Burke from Henry Seymour Conway. The majority of the documents in this volume are in the Yale collection; the remainder are reproduced from copies of the originals. The wealth of materials available pertaining to the writing of the Tour and to the Life is unprecedented in eighteenth-century literature. These letters are one more example of the prodigious depth of information we have concerning Boswell’s writing process.… The amount of work these early letters represent is staggering. Boswell is extremely diligent in revision, and Malone no less so despite the fact that time spent on the Tour was time not spent on his edition of Shakespeare. The two men shared a love for Johnson and for the act of representing Johnson in print. They also came to share a deep friendship.… Boswell was a complex contradictory man. He admitted to Malone that he was filled with “seeming inconsistencies,” yet he maintained a depth and attractiveness of character. Garrick and Burke could not, or did not care to, see past Boswell’s sometimes troubled and often demanding personality. But others could, most notably Malone and, of course, Johnson. As in the previous research volumes, the editing here is superb. This is not a book for the general reader but for specialists in eighteenth-century literature and society. Its place is on the shelves of university libraries and the reference departments of large public libraries. Like the other twenty-nine volumes, published and projected, in the research edition, its annotation is turned out from the text towards the life and culture of eighteenth-century Britain—to its literature, language, law, religion, medicine, politics, local history, biography, and genealogy. [For] example,… two aspects of linguistics, dialect and style, [are] featured in the letters between Boswell and Malone,… that great Shakespearian scholar. The Boswell editions have long been regarded as the acme of scholarly method, and the Garrick-Burke-Malone volume is no exception.… The handling of the textual complexities of the Malone-Boswell collaboration in the Tour and the Life is especially brilliant, and a major contribution to Boswell studies. The correspondence between [Malone and Boswell] is a unique record of both men’s professionalism as writers—of the hundred of decisions they made together, not without at times frank disagreement, regarding matters of decorum, style, facts, and tact. It is also a humanly engaging record of Malone’s … efforts to keep him on the right track through innumerable adversities, both public and private. They loved and supported one another constantly, although occasionally Malone could write an angry enough letter when his friend’s self-pity and vanity got to be too much for him. In gratitude, Boswell dedicated his Tour to Malone and praised and acknowledged at length his vital help in the Preface to the Life. The notes throughout this Research edition are extensive, supplying the reader explicit scholarly contexts for the letters. Three appendices are added, one of which contains a character sketch of Malone written by Boswell and published in The Public Advertiser shortly after Malone published his complete edition of Shakespeare. When he first encountered Garrick, the splendid performer was already rich and respected and close to the peak of his career, one of the “best known men in Great Britain,” while Boswell was still an obscure young Scot.… [T]he letters [Burke] and Boswell exchanged show that Burke often returned his regard and he afterwards agreed with a friend that the Life was “a greater monument to Johnson’s fame than all his writings put together.” They differed on many subjects … but such differences did not always overshadow their talk.